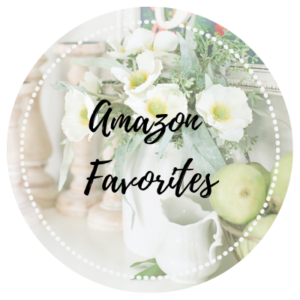 Gluten and Dairy Free Chocolate Chip Cookies - Jenuine Home - Interior design, decor, diy for your home and Instant Pot Creations for your tummy. 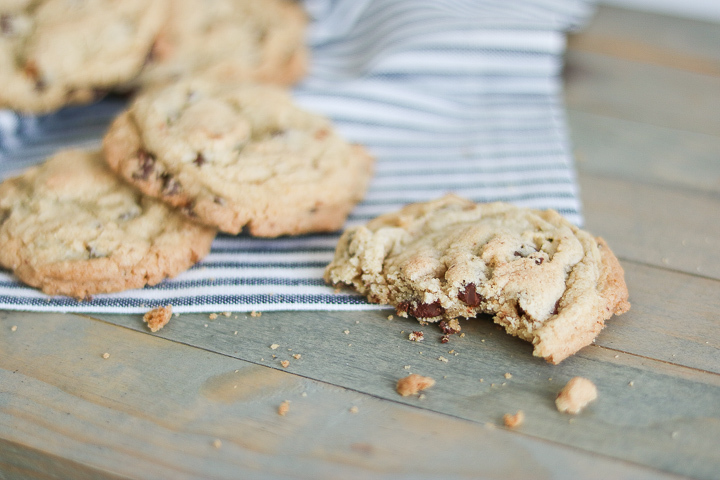 These classic chocolate chip cookies (gluten and dairy free) have that delicious crispy golden edge and chewy middle! They taste like the real deal with that buttery flavor and chocolate chip in every bite. Eat and dunk with your favorite non-dairy milk! 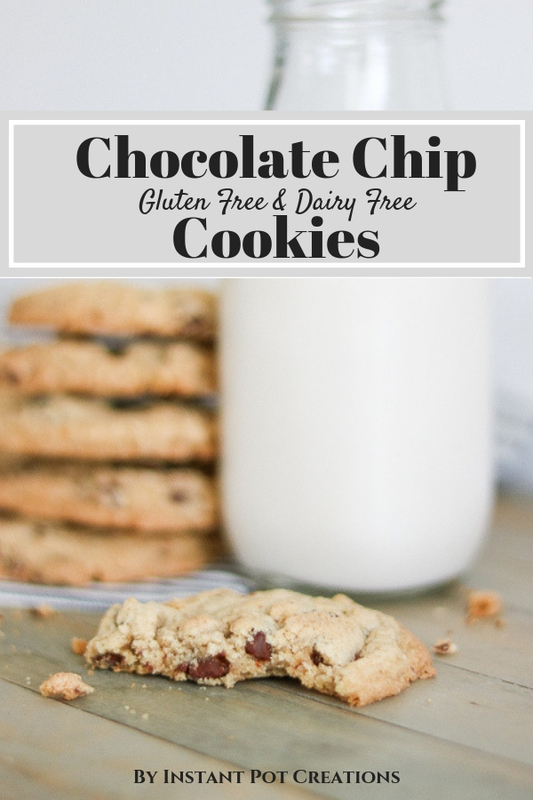 We’re so excited to finally have a gluten and dairy chocolate chip cookies recipe that is allergy friendly for our family. 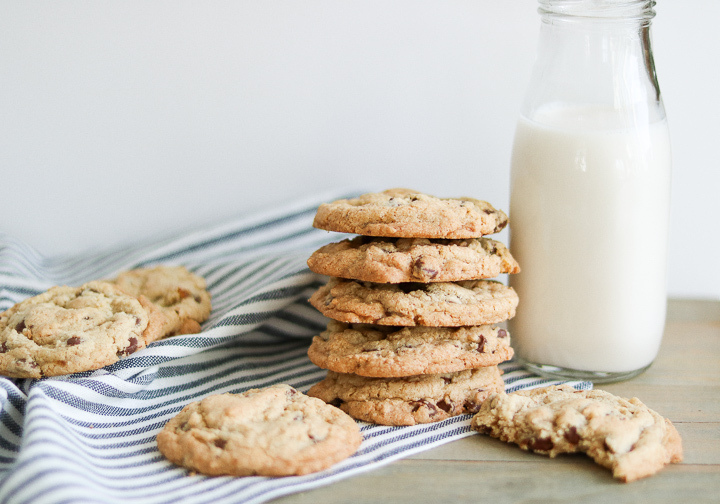 We haven’t baked our favorite traditional chocolate chip cookies since last August, when we started our journey to heal our daughter’s gut and removing most inflammatory foods from our diet. 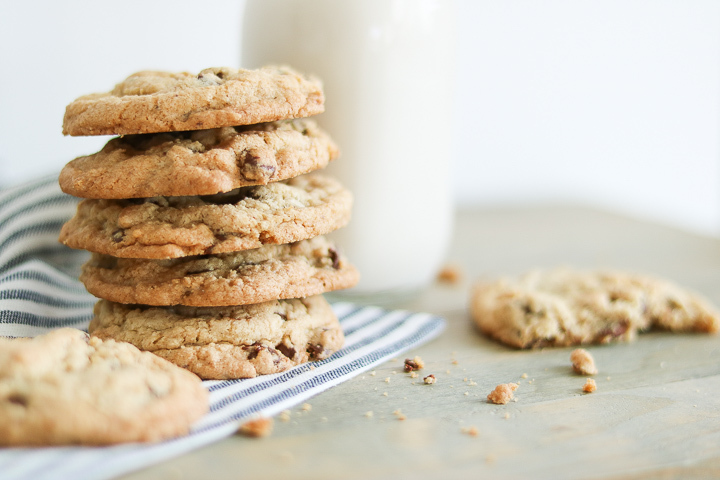 Our traditional recipe converted pretty easily into a gluten and dairy free chocolate chip cookies recipe that tastes just like the regular version! If you don’t have any allergies, feel free to make the recipe using regular all purpose flour and butter in place of gluten free and non dairy butter. Our next task was to find a suitable dairy free chocolate chip that tasted delicious and didn’t contain soy lecithin. We avoid soy due to another child’s intolerance. Our favorite gluten, soy and dairy free semi sweet chocolate chips winner are these from the Guittard brand. However, they are not certified dairy free because they are processed in a plant that manufactures dairy products. Please take note, in case of severe milk allergies. Nestle Toll House Simply Delicious also makes chocolate chips that are free of the 8 major allergens: tree nuts, peanuts, egg, milk, wheat, soy, fish and shellfish. This is another option if you need to avoid those allergens. The chips have a more dark bitter chocolate taste. The flavor was not my favorite but made a decent replacement if you need to avoid the additional allergens than the Guittard brand. Enjoy Life is another great brand that many people use as an allergy friendly chocolate chip option. It’s free of gluten, peanuts, tree nuts, dairy, casein, soy, sulfites, egg, lupin, sesame, fish and mustard. Cold non dairy butter. The non dairy/soy free butter sticks we like best are by Earth Balance. The sticks become soft pretty easily, so cold is a must. Chill the dough for 15-20 minutes before baking to prevent cookies turning into pancake status. Preheat the oven after mixing the dough. Then the dough has a chance to chill while the oven preheats. 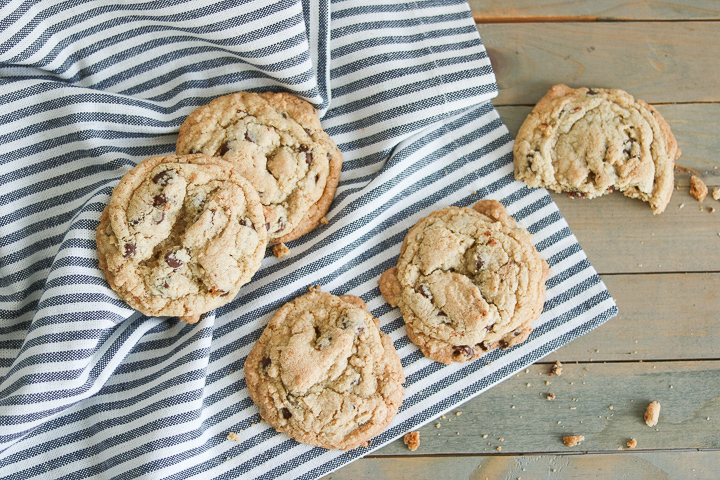 Keep dough in the fridge between baking batches, taking out only to scoop more cookies. Use a cookie dough scoop to make balls that take time to melt and bake evenly. Bake on a cooled baking sheet that is lined with a silicone mat. Rotate batches between 2 cookie sheets so that each one has a chance to cool down between rotations. The cookies that bake on a slightly warm or almost hot pan will cook too fast and end up crispy flat things. Take cookies out of the oven right before they are fully cooked. Look for slightly golden crispy edges or tops that are starting to crack but still look a little gooey in the middle. The cookies will continue to cook on the sheet as they cool. This means crispy edges and chewy centers after they’re completely cooled. Our family is thrilled to have treats again! After about 6 months without any homemade chocolate chip cookies, we were ready. There’s just something so comforting that it’s almost like the essence of home is contained in a simple cookie. 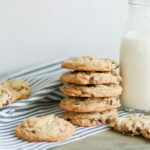 Now that we have a gluten and dairy free chocolate chip cookies recipe, we can get back to enjoying those simple little pleasures. 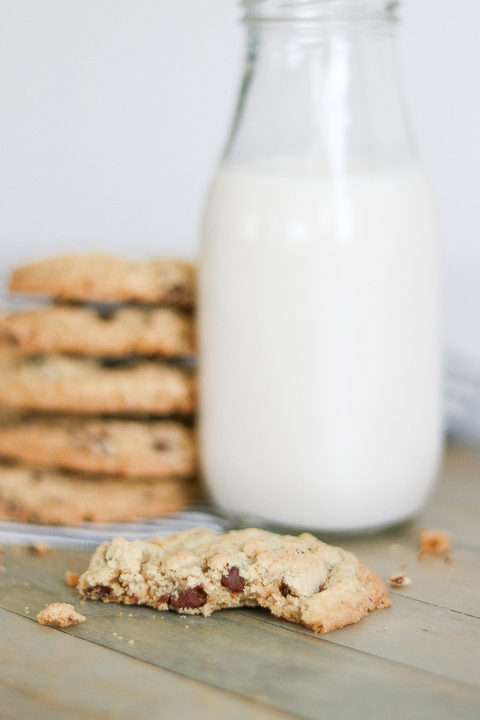 Enjoy these classic chocolate chip cookies again now that they are gluten and dairy free! If you don't have any allergies, go ahead and swap the ingredients for regular flour and butter! Slightly crispy on the outside and chewy in the middle, just how you like them. In a large mixing bowl, cream butter and sugars together using the paddle attachment. It may look dry at first. Keep mixing until sugar and butter are creamy. The paddle friction will warm up the butter and make it creamy. Add egg and vanilla. Mix well to combine. In a small bowl, combine dry ingredients: flour, baking soda, baking powder and salt. Slowly add the dry ingredients into the batter, until well combined. Add chocolate chips and use the mixer to combine. Cover mixing bowl and place in the fridge for 15-20 minutes to chill. Using a 1.5" scoop, or spoon, place cookie balls onto an ungreased baking sheet. Or use a silicone baking mat on the baking sheet (which is my preference). Keep the cookie dough in the fridge between baking batches. Bake cookies for 8-10 minutes in oven until dough looks cooked, but in between cracks of dough, it still looks a little gooey. Or until edges start to turn golden. Place cookie sheet on a rack to cool for 5 minutes. It will continue to cook in the middle as it cools, allowing the cookie to have a crispy edge but chewy middle when cooled. Transfer off cookie sheet onto a wire rack to completely cool. On a separate baking sheet (room temp), scoop out the next batch of cookies and bake. Repeat the baking process until done. *Note that baking cookies on a cool sheet is vital to preventing the cookies from spreading too quickly before cooking and ending up with flat cookies.